In Bangkok's warm, tropical climate, waterparks are a perfect escape from the heat. They guarantee loads of fun for the whole family, especially the little ones who are hard to please. They're even a great place to cool off after a night of heavy partying. 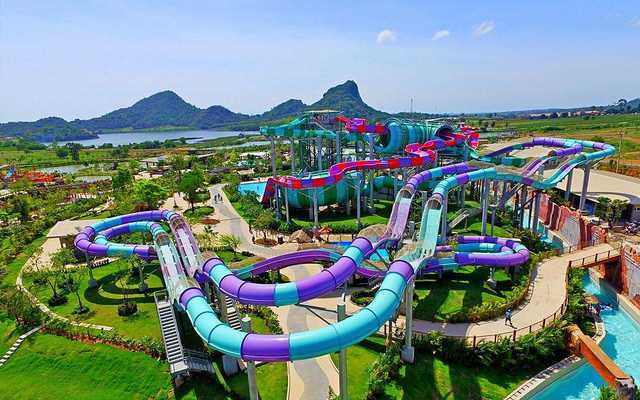 Ramayana is Thailand's biggest and best waterpark with over 21 rides built over the remains of an ancient city surrounded by beautiful, lush green scenery. Apart from the dedicated rides, there are a bunch of other attractions like the floating market, water polo, a lake island and even Zumba lessons. You also get wifi free throughout the park, guess who's excited now! Ticket Price/Entry Fee: THB 1190 for adults (above 122cm) and THB 890 for children (91 - 121cm). Some combo offers can be found on their website. Dress Code/Rentals: Towels can be rented at THB 99 per day, and you can buy brand new swimwear from the on-site shop. You can also rent out lockers for THB 120 - 190 per day. Popular Rides: The Aqualoop and Freefall slides are perfect for adrenaline junkies, they both employ nearly vertical drops which translate to insanely fast speeds. The Duelling Aqua-Coaster allows riders to race around two 240-m long tubes and is unique to Ramayana. How to Get There: Ramayana is located close to Pattaya, which is a one and a half hour drive from Bangkok. Take a bus from Ekkamai station to Pattaya and once in Pattaya, hail a cab to the water park. Fantasia Lagoon is a fantastic water park right on the roof of The Mall Bangkae. It is one of Bangkok's many hidden gems, and you probably won't find it in any guidebook. The crowd is mostly made up of residents, unlike all the tourists you will find elsewhere. Being atop a building, you can enjoy great views from all of the rides. There is only one eatery inside the park, but, being extremely budget-friendly, you are allowed to bring in food from outside. Right next door, there is also a cute little amusement park filled with small rides that kids will love. Dress code/Rentals: Towels, lockers and inflatable tubes can all be rented for a nominal fee. It is mandatory to wear a swimming cap (can be rented as well). Popular Rides: The Lazy River, as the name suggests, is perfect for lazing around. Pirate Cove is very popular among kids and houses a mini pirate ship in the middle of a pool. The best attraction, however, is the Slider Tower, which gives you panoramic views of the entire city as you twist and twirl sliding back down to roof level. How to Get There: Fantasia is located at 275 Moo 1, Petchkasem Rd. The easiest way to get there is by simply booking a cab. Ask to be taken to The Mall Bangkae, as many cab drivers might not be familiar with the Water Park's name. Pororo Aquapark is another rooftop water park that has been recently renovated. The park, as the name suggests, is themed after Pororo, a cartoon Penguin from South Korea who is famous throughout southeast Asia. On the top floor of CentralPlaza, the park spans over ten thousand metres and has an assortment of rides suited to everyone's taste. Whether you wish to merely laze in a pool or be hurled through tubing six stories above the ground, you will find what you are looking for, here. There are over six hundred metres of water slides. Ticket Price/Entry Fee: THB 290 for children under 120 cm. Free for children under 90 cm, THB 400 for adults. Dress code/Rentals: Locker rentals are available. You must be in swimwear to enter the park. Popular Rides: Pororo's Funnel is the award-winning flagship waterslide in the park and features twisting and turning the 158-metre long tube. Another crowd puller is Petty's Speedway which consists of consecutive corkscrews that allow the rider to reach mind-boggling speeds. For the more faint-at-heart, there are nine different pools to relax and laze around in. Siam Park City often referred to as the 'Beach of Bangkok', is the first Water Park to have been built in the city. It was built around forty years ago, and since its inception has been visited by the likes of Michael Jackson. The biggest attraction, from where the park gets its nickname, is from the artificial beach. This beach happens to be the largest of its kind, in the entire world. The Water Park is attached to a Dry Park as well, so once you're done getting wet, you can have even more fun on the roller coasters and bumper carts. Ticket Price/Entry Fee: The entry is THB 950 for adults (over 131cm), THB 790 for kids (100 - 130cm), and no entry fee for children below 100cm. Dress Code/Rentals: Lockers are available for rent. It is mandatory to be in swimwear to enter the water park. Popular Rides: The Speed Slide held the world record for being the tallest water slide, at seventy-five feet. The Super Spiral is another fun attraction where riders spin around the winding tube gaining velocity until they are launched into the pool below. There's also a slow Flowing Pool and a Wave Pool if water slides aren't your forte. How to Get There: Siam Park City is located on 203 Suan Siam Rd in Kannayao. To get there, you can board bus no. 60, 71, 96, 115, 178 or 519. If coming by taxi take the Serithai exit while heading to Minburi. Go straight for a kilometre then turn left to Siam Park Avenue. Flow House is entirely different from the other water parks on this list. It is a proper action sports hub that targets the surfing enthusiast, and anyone who has ever wanted to give surfing a go. The place has certified instructors who can teach you the basics of surfing from scratch; at the end of a session, you are bound to do better on a board. Occasionally, flow house is transformed into a party destination with DJs and strobe lighting. The Chang Surf Bar airs live sports from around the world, and there are even club games like pool, ping-pong, foosball, and darts. The best part? Entry is free, and tourists are invited with open arms to come and chill. Ticket Price/Entry Fee: No entry fee. Sessions on the surf machine cost THB 750, but keep in mind you must book a slot in advance. Dress code/Rentals: Lockers can be rented at THB 100 and towels at THB 50. All surfing equipment is in the house. Popular Rides: The top-of-the-line FlowRider Simulated Wave-machine has been custom made and imported from San Diego in the USA. Surfing and bodyboarding on the FlowRider are almost as good as on the sea, without the dangers of open water. How to Get There: Flow House is located at A-Square, 120/1 Sukhumvit 26. It is a 5-minute walk from the Queen Sirikit National Convention Centre. If you're in Bangkok and your children have gotten bored of all the shopping you're doing, visiting a Water Park is a must. You'll be pleasantly surprised at the amount of fun you will have with the family as you take a break from all the heat. Even as adults, nothing beats the joy of sliding down a tube as fast as a sports car and being launched into the cold water below. 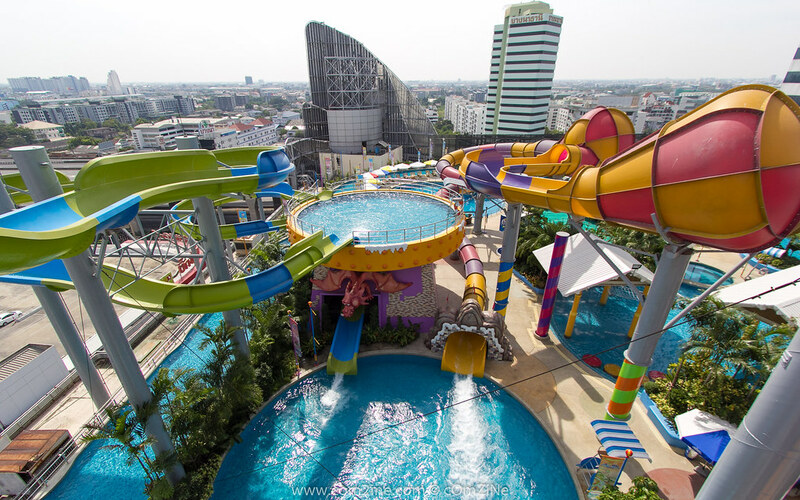 Have a splashy summer at these Waterparks in Bangkok!